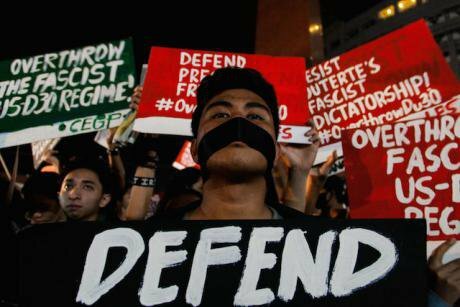 January 19, 2018 - Philippines - Media practitioners and university press organizations held a Black Friday protest against the curtailment of the freedom of the press by the Duterte administration. J Gerard Seguia/Zuma Press/Press Association. All rights reserved.Georgina* is a transgender digital marketer for a boutique public relations agency in the heart of Manila's business district. A resourceful SEO specialist, 28 year-old Georgina spends her office hours driving traffic to her clients’ pages, even skilfully hiding fake ad links to lure clicks. But Georgina’s 9-to-5 job shows only a fraction of her real value in the digital arena. Georgina is an online influencer – except, unlike the photogenic jetsetters who flood Instagram and YouTube with glossy fantasies of an aspirational lifestyle, she is carefully, completely anonymous. Georgina maintains half a dozen Twitter and Facebook accounts with over a million organic followers in total. Each page boasts a particular brand of content, from lovesick romantic quotes to “inspiring” platitudes to viciously snarky memes. Her legions of followers are quick to like, repost, and retweet her entertaining posts. Once in a while, Georgina slips in a hashtag promoting a new movie release or soft drink brand, which her followers retweet. Before they know it, they’ve helped her make an entire commercial campaign go viral and top Twitter trending rankings globally. Georgina is an anonymous digital influencer who carries out undisclosed paid campaigns for clients that can pay for her reach and influence. She started out working for PR agencies handling household brands and telcos – until the 2016 Philippine elections, when she took on her first campaign for a high-profile politician running for national office. In the Philippines, influential online personalities and “troll armies” are credited with winning Rodrigo Duterte the presidency in 2016. Even after carrying Duterte to victory, “trolls”, or “Dutertards” as his fanatic supporters have been derogatorily dubbed, continue to vociferously share fake news and silence dissenters. But who are they? Who exactly is responsible for creating fake news? What kind of people sign up to become “trolls”, and why? What kind of skills do they have, what motivates them, and what shapes the content they create? As co-authors of a new report published by the British Newton Tech4Dev Network, we found that while the moral panics of the Philippine public are focused on celebrity influencers, the problem of political trolling and disinformation is actually more insidious, systemic, and deeply rooted than any single hero or villain. Undetected and unseen, attention hackers like Georgina form part of a highly professionalized industry of digital political disinformation in the Philippines, a country of 67 million active social media users. Our informants supplied us with the passwords to their anonymous influencer pages, as well as fake accounts used for political campaigns on Facebook and Twitter. With this unprecedented access, we were able to unearth a shadow industry that is professionalized and hierarchical in its organization, strategic in its outlook, and questionable in its ethics. We also met Felix, a digital advertising specialist who, like Georgina, moonlights as an anonymous digital influencer. When he hit 100,000 followers, he was offered his first commercial contract. Now he runs a "quote page" with 2 million organic followers. Hired for his first political campaign via Twitter direct message, Felix joined a team of anonymous influencers tasked with building their politician client’s image and brand on social media. Felix’s followers amplify his messages until mainstream news outlets pick them up. Other times, he reposts pieces of mainstream coverage – news reports, opinion pieces – that speak well of their client. “You need to go slowly. You can’t post branded content right away; you’ll lose followers. Sometimes they call us bayaran (sellout, paid hack) because branded content comes first,” says Felix. “When something trends organically, only then can we slip in branded content,” he adds. Artificially trending hashtags is only the tip of the iceberg. Other tasks might involve digital black ops – for example, seeding revisionist history narratives or sowing divisiveness in online communities. Anonymous influencers like Georgina and Felix are ranked and paid according to the engagement they generate – likes, favorites, shares, retweets, or video views – and they receive bonuses for outstanding engagement in a campaign. It could be cash, or the latest smartphone model. Georgina is the right-hand woman of Dex, a seasoned public relations strategist with a select portfolio of elite political clients. Prior to her career in online management, Dex was an advertising executive. Having achieved financial and professional success, she was on the hunt for her next challenge – and found it in political PR. If people like Georgina and Felix are combatants in the political PR battlefield, ad and PR industry leaders like Dex are their generals – the chief architects of disinformation. “I've overcome a lot of competition in other industries, like telecoms for example. Every time I enter a war, I find a way to win. To me, everything is war,” she said in our interview. While trolling is attributed to the likes of Mocha Uson and other notorious bloggers, the real chief architects of disinformation hide in plain sight. Holding respectable day jobs as top executives in boutique ad and PR agencies, their political hustles on the side – undisclosed and unregulated – are an open industry secret. With their track record for launching Facebook business pages, trending hashtag campaigns worldwide, and building engaged communities for household brands, telcos or celebrities, tried-and-tested industry techniques of spin and reputation-building acquire new power and momentum in their hands. Strategy in hand, the chief architects of disinformation staff the teams of anonymous digital influencers to take campaign messages to smartphones and screens. They create the pay structures and come up with the incentives that motivate the influencers. But the work doesn’t stop there. However, they are necessary to generate illusions of engagement. Fake account operators create a bandwagon effect that affirms the key messages of a political campaign, and encourages real, unpaid grassroots supporters and political fans to openly express their support for a particular politician. The aim of our research was never to name and shame “trolls,” but to understand their identities and motivations, how they operate, and how they morally justify their work. Beyond the Philippines, global democratic players in the west would do well to pay closer attention to how a highly skilled digital workforce for hire might be weaponized for digital disinformation in other democratic countries such as the United States and United Kingdom. Understanding is the key to finding solutions at every level of disinformation production, which we propose in our report. More importantly, understanding is the key to taking a stand against the way disinformation is influencing free political discourse, rewriting narratives, and shaping the democratic project, both in the Philippines and far beyond. Architects of Networked Disinformation: Behind the Scenes of Troll Accounts and Fake News Production in the Philippines is published by the Newton Tech4Dev Network and funded by a British Council Newton Fund grant.